I Don't Like LHC Scientist's Quotes That Start With "If It Does Destroy the World..."
For me, it's nonsense to say that there are forces coming back from the future to stop the machine from working. It really is just ridiculous to think that is the case. If people could travel forward or back in time, why wouldn't they have done something better or worse for humanity than coming and twiddling around with the LHC? 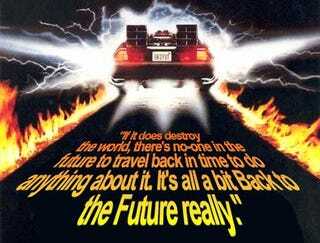 If it does destroy the world, there's no-one in the future to travel back in time to do anything about it. It's all a bit Back to the Future really. It's part of this whole mystery about the machine — people are willing to believe anything. Physicists sometimes shoot themselves in the foot by not saying, 'We won't destroy the world with black holes,' because they work on probability. Saying, 'This won't happen,' is just not ingrained into them.